With only a week left in California, Barry and I opted against staying in an affordable (and possibly grungy) hotel room in San Diego or Los Angeles and hit the road on another US Road Trip. We considered and quickly rejected hiring an RV. We thought it would be too stressful to drive something so big and too restrictive in terms of where to park along the way. But transport and accommodation in one was too appealing to give up on. 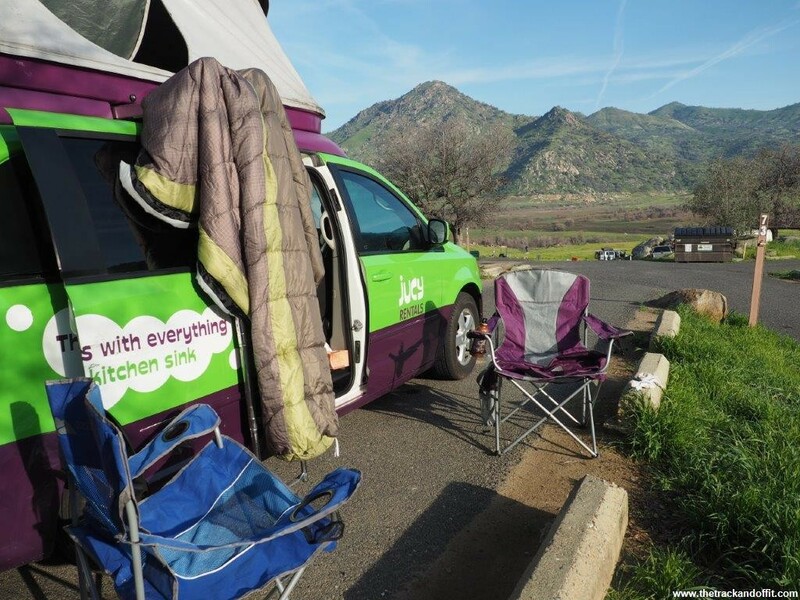 A little internet research revealed small campervan/mini RVs for rent in LA. Yes please! 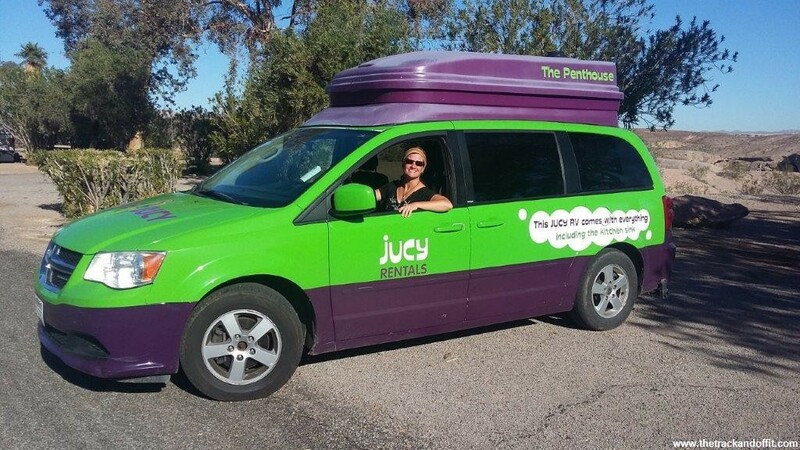 We came across two companies that fit the bill: JUCY Rentals and Escape. 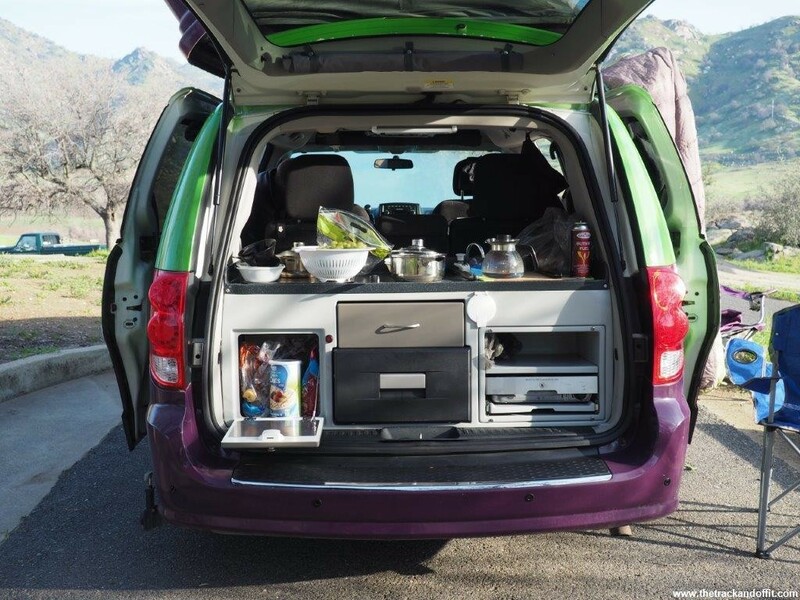 Both basically provided the same thing, a refurbished Dodge ‘Caravan’ where the back seats converted to a double bed, with a roof tent on top and a sink, stove and fridge in the back. JUCY vs Escape – How to Choose? Really not much in it, depending on what you need. The Escape without a roof tent (only the middle tier option was available for our dates) would have been fine for the two of us but we liked the idea of having different ‘rooms’ in our van. At any rate, I think we’d have been happy with either option. There was much to-ing and fro-ing via email and twitter to @JucyLucy to clarify changes and contradictions. (Sometimes I love Twitter for making queries public and forcing companies to get back to you.) Unfortunately, the company is New Zealand owned (that’s not really the unfortunate part), and all of their customer service team seem to be based there as it generally took at least 24 hours for someone to get back to me. We were in fact just about ready to book the escape van when JUCY came back to me with answers to enough of my questions and confirmation of a discount code which wasn’t working on their site. They even waived the one way fee for us to return the van in Las Vegas (not sure if this was intentional, an accident or just to make me stop asking questions). Obviously, I’m budget conscious so with 24 hours to spare, we were booked. We picked up the van in LA and the staff were great. Professional and detailed without making you feel like an idiot. We were given a tour of the van and how everything worked and were given some time to play with the gadgets and get used to things before finalising everything and driving off. We went for the Collision Damage Waiver insurance option at $10 per night instead of the full thing at $22 per night (I was fairly sure our travel insurance would cover liability) and I wasn’t questioned or pressured into upgrading or penalised in any other way. We were given the Dodge (they also have converted Chrysler Town & Countries) with the roof tent which opened up like a clam shell, with strong plasticy fabric sides, at the press (and hold) of a button. The front of the car was roomy for us short folk, with two cigarette lighter style points, one of which was on a 12v secondary battery, which was good for charging our phones. We picked up their $5 USB car charger and a $5 MP3 player cable. Unfortunately, the car charger broke after about two days. JUCY refunded us in Las Vegas but we did have to spend another $15 in a garage replacing it so we wouldn’t be stressed about work and flat electronics. My MP3 player also broke but not until nearly the end of the trip and I think Barry was pretty happy not having to listen to the Beach Boys or America anymore. I loved the kitchen in the back. 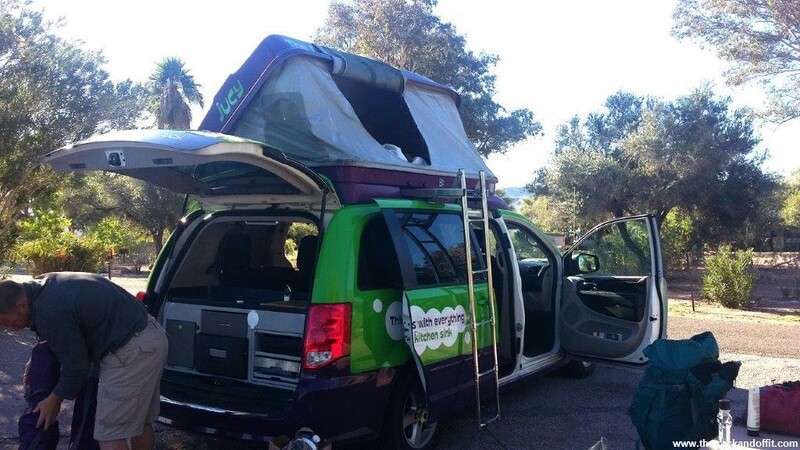 The fridge ran on the secondary battery and was a drawer in the middle of the van. The sink had a pump similar to a caravan which brought up water from the tank installed under the car. We had two camping stoves pretty much exactly the same as my family has for camping. One was portable and the other locked into a sliding drawer. Two new gas canisters were included but we also got the two half empty ones already in the stove. Over our week of cooking porridge every morning and a hot meal at night we got through the two half canisters, one full one and a small amount of the other full canister. We were also cooking at high altitudes and near freezing temperatures so I don’t think you would need more gas than what we had for a trip of 7-10 days. There was enough cutlery and crockery for four people, three saucepans, one large frying pan, a few utensils and a useless-to-us coffee filter pot. I was told that it was also our tea kettle but when I put it on the stove it took ages to boil and the handle melted a little. I think it’s really supposed to sit on the side and have boiling water poured into it. I believe the newer vans also get a kettle but I just boiled water for tea in the smallest saucepan. The can opener didn’t work to open tins of tuna but was good for beer bottles (I gave feedback, I’m sure they’ll replace it). The vans are automatic and quite easy to drive. We found the van needed a longer breaking distance as the rear of the car made us a bitter heavier than we’re used to but we adjusted to that pretty quickly and kept a safe distance. The kitchen things rattled around and at the first opportunity we had to pull over so Barry could rearrange things (he hates a jingle). 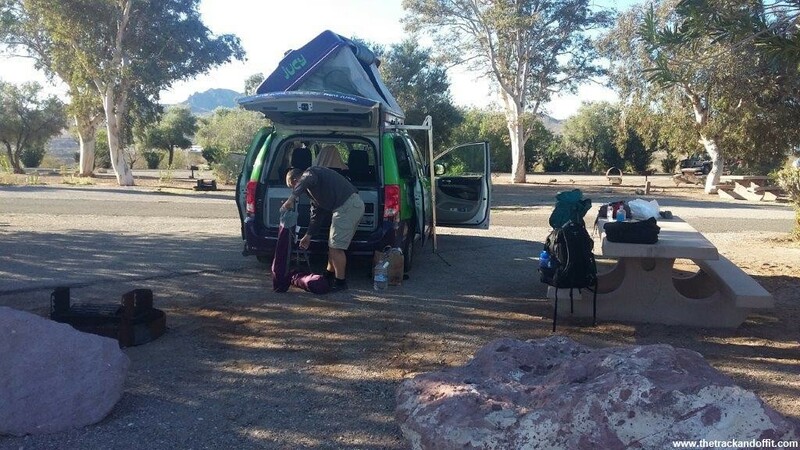 We mostly stayed in National Park campgrounds but as the van is basically a car it would have been easy to pull over on the side of the road or outside somebody’s house for a free night sleep. We spent most of our nights upstairs in the roof tent. There’s a narrow ladder but maybe for ‘young people’. I’m not sure my dad would have loved climbing up there. There are lights and another 12 volt car charger up there. We found the mattress comfortable. We were roasty toasty with our sleeping bags and hand warmers (also part of the winter pack) which I put at our feet. At lower altitudes I think we would have been fine with the blankets provided, especially if they had given us four sets as advertised instead of only one per person. 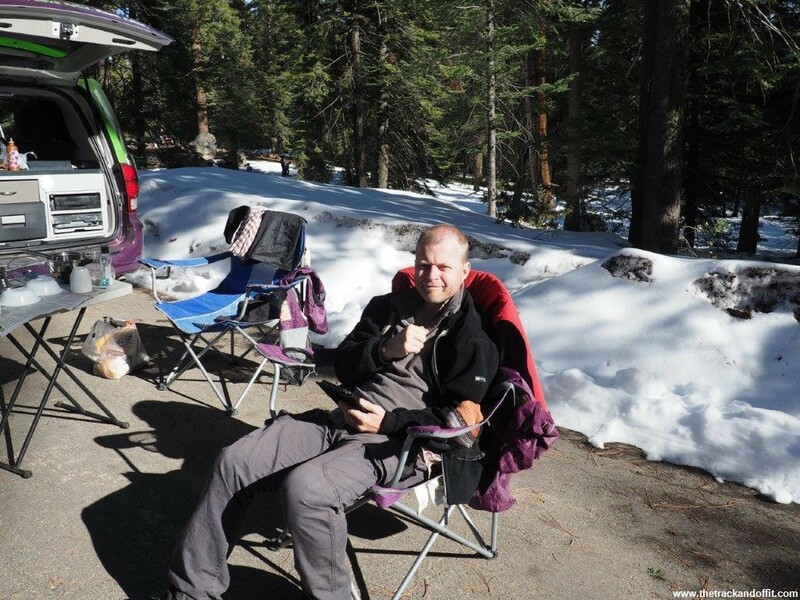 We were grateful for the sleeping bags when we were in the snow at Sequoia and the freezing temperatures of the Grand Canyon. The only downsides were that I kept forgetting that my side was shorter and hit my head on the ceiling. The tent was also wearing a little and the zip coming away from the plastic fabric. There’s enough space up there to keep the bedding and a few clothes, even when closed. I think you could get more in but it wasn’t necessary for us. Just to mix it up and experience everything, we also spent a night in the bed conversion in the back of the car on a very cold night. There are curtains to close on all the windows and another that drops down behind the front seats so not much light creeps in. We were really warm with the hand warmers and sleeping bags. The mattress seemed comfortable enough though you can feel the gaps where the cushions come together a little. I’d recommend sleeping with your heads at the kitchen end so you’ve got the side panels for your tissues and lip balm. Also, with our heads at the driver end, our sleeping bags, which we unfolded to use as blankets, kept slipping off the sides when we rolled over as there’s a lot of space between the bed and the door well. We set up the back of the car with the inside table and bench seats a couple of times but mostly didn’t bother. I found the table too high. I prefer my tables not to reach mid chest height. Even when it was chilly, we preferred to eat outside, either on tables supplied at the camp ground or the extra folding outdoor table and chairs. There’s more storage under one of the bench seats than I thought there would be. The space drops below the car and managed to fit all of our stuff (okay, so we’re hand luggage only but still), the sleeping bags, the folding camp chairs, some of the kitchen things (that rattling again!) and still had room to spare. If four people were travelling it would be possible to store the luggage easily, if everyone had a soft backpack of around 40 litres. When driving there would be enough space for more bags and cases in the back with the rear passengers as it’s quite roomy back there but probably not ideal. In the end we were really happy with our choice. In the winter it was great for us to have the extra space to sit in the back and read after dinner. It would be manageable with four but a group travelling would definitely be more comfortable in warmer months when you want to spend more time outside. See how happy I look? 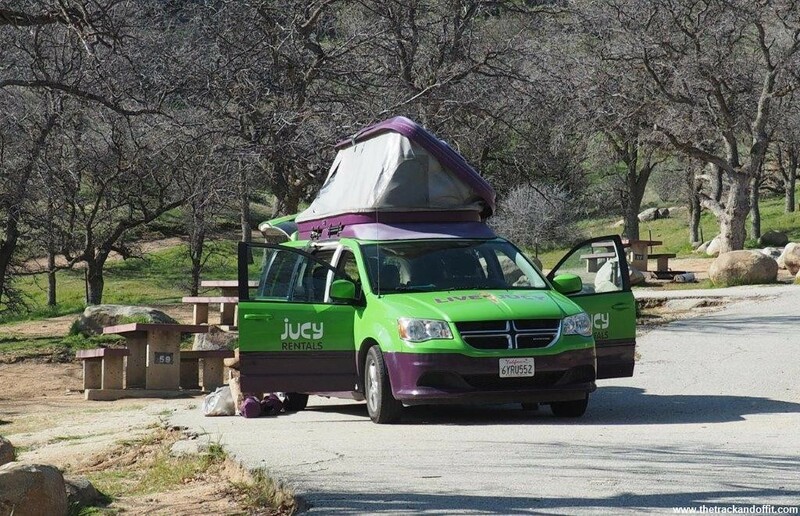 I did love my JUCY van though I’d like to try the Escape sometime. I see they have an office in New York City and a few on the West Coast – an across country road trip anyone? 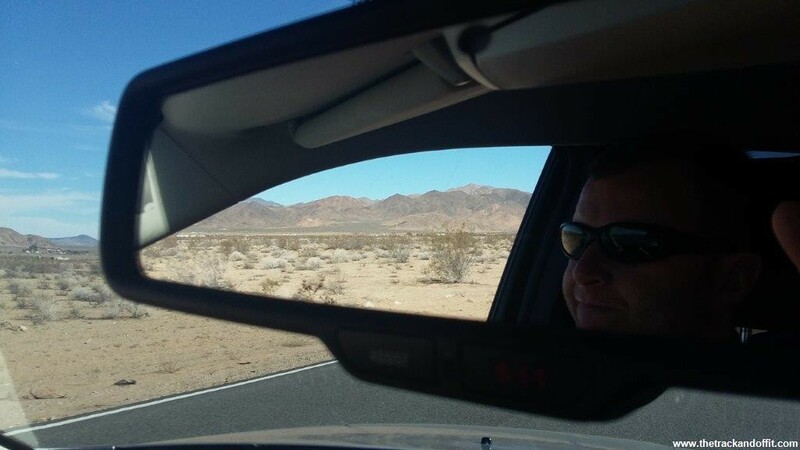 This entry was posted in My Travels and tagged USA by Simone. Bookmark the permalink. I think so. And I might have to come on your trip! we’ve rented an escape campervan twice now and loved it! Great to hear! Yea the campervans! Thanks, glad it was helpful. Have a great time in NZ. My sister is there right now, campervanning around. Hope everything is just as good for you! Would be great to hear how JUCY was in NZ after your holiday.